Welcome to Grady V's American Bistro  Simple, honest, goodness. These are the three main pillars behind the inception of Grady V's American Bistro. In 2009, as Premier Catering & Events began to take shape, the opportunity for a retail establishment in the Bayou Country Club presented itself. After carefully reviewing how this space could be used, we spent much time and dedication revitalizing the space while maintaining the building's deep historical ties to the community. The building renovation was fantastic and we had to next determine the type of food and beverage service we were going to provide. We decided on classic favorites. Our goal was to provide uncomplicated, honest and good food and drinks to our guests. 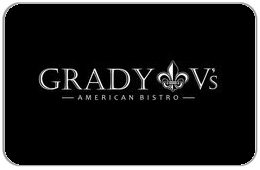 Grady V's American Bistro was then born and our doors opened. The community embraced us then, embraces us now and has proved that our vision was accurate. Guests still crave true, honest, American Cuisine.